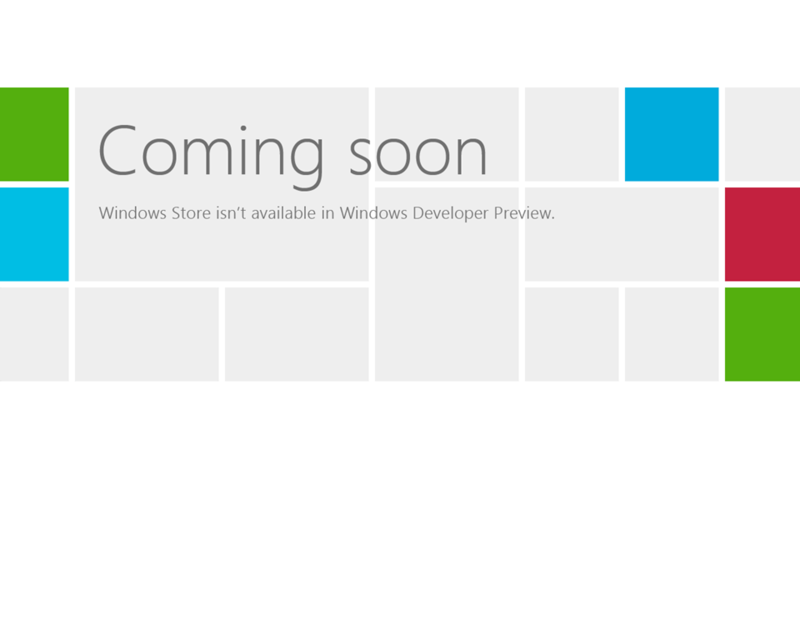 Like a lot of you, I got my hands on the Windows Developer Preview of Windows 8, that was made available to the Public following Steven Sinofskis keynote adress on the Build conference earlier this week. I will not provide a review of this build, since it is far from feature complete as well as being pre-beta software. 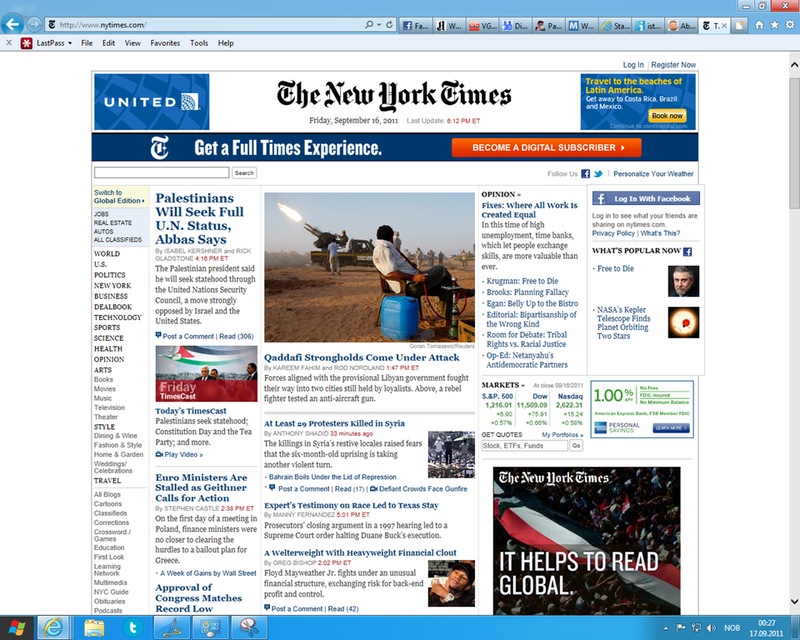 The Metro-style Interface takes some getting used to, especially since I am having in on a desktop computer without any touch-capabilities, and also having it on a screen with a resolution of 1280×1024. 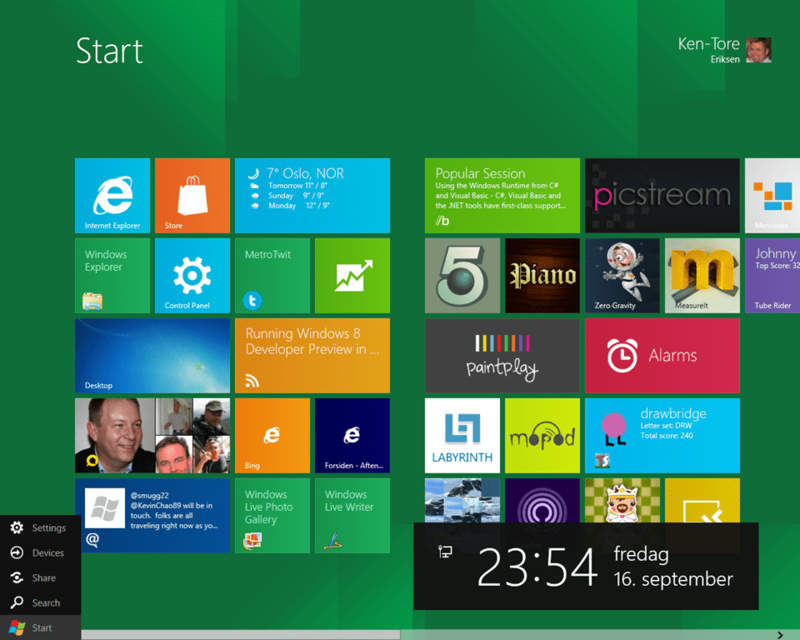 By moving the mouse to the lower left corner the so-called charm-menu appears – as well as the time and date. 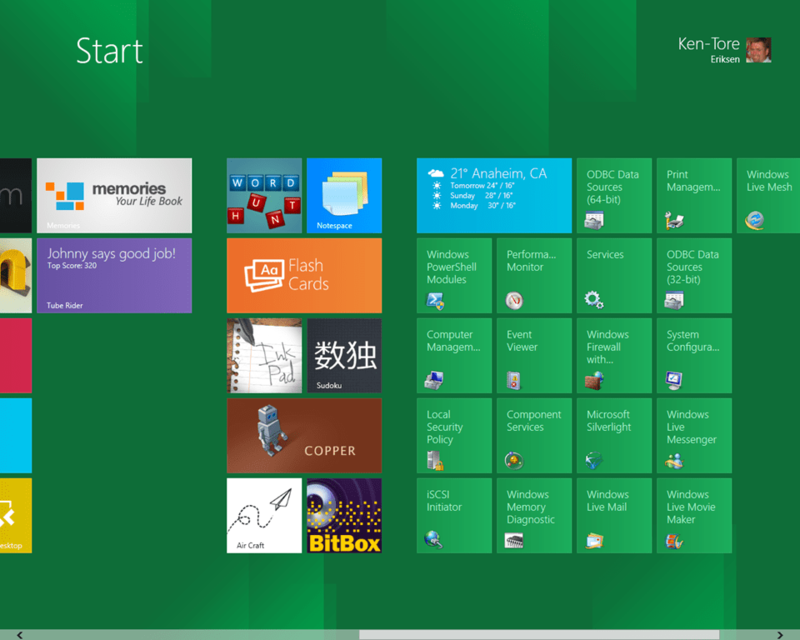 By scrolling right with the mouse the tiles with the applications I have added appears. All these can be rearranged to your own hearts delight. 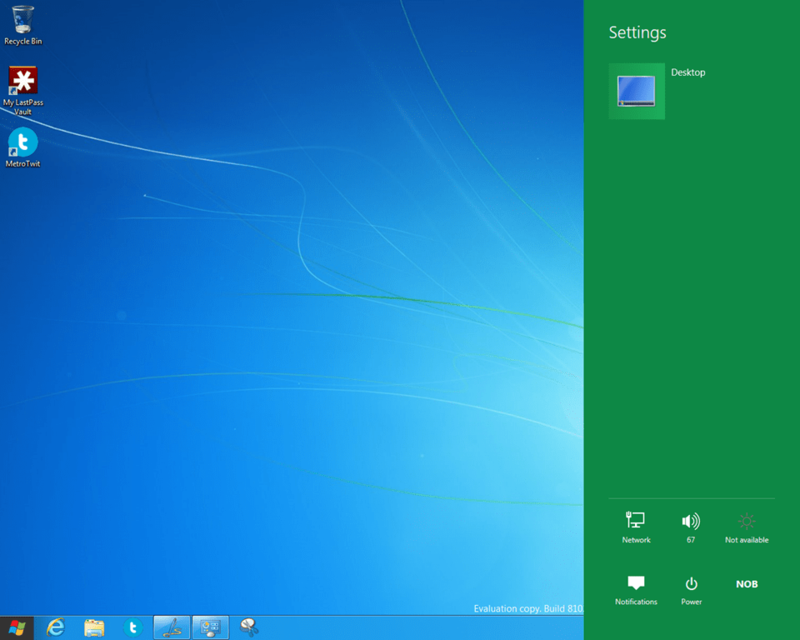 When hitting the desktop tile on the start-screen you end up here on the classic Windows desktop – sans the classic Start menu. 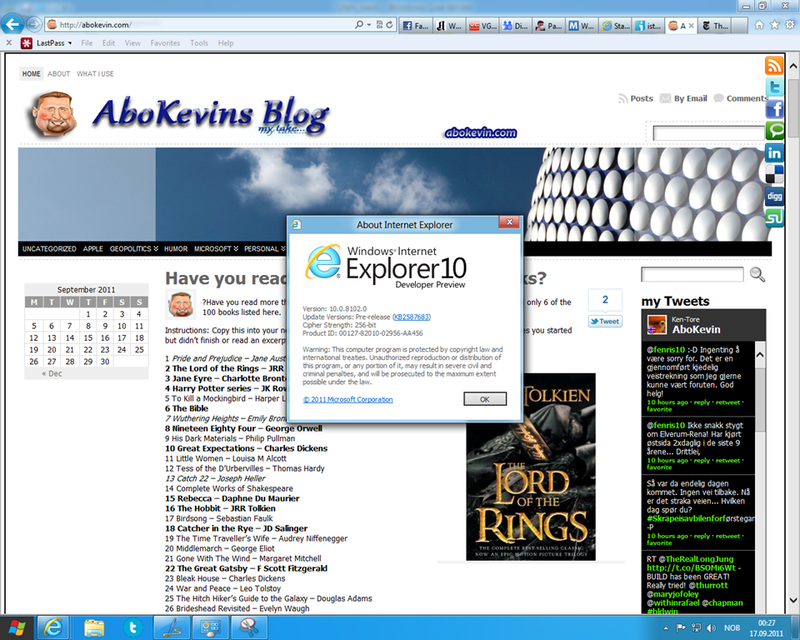 There are two versions of Internet Explorer 10 in WDP; this one being the full-screen version Metro-style one. 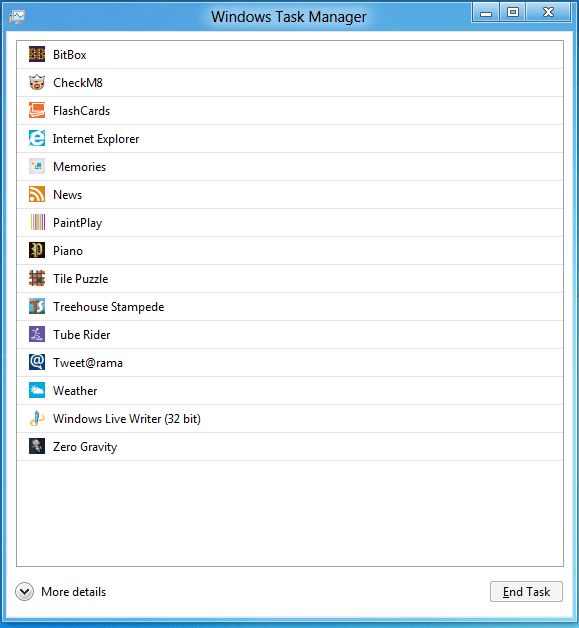 The Metro-style IE10 does not allow any plug-ins and has a very minimalistic interface. You can bring up other “tabs” by hitting the right-click button. 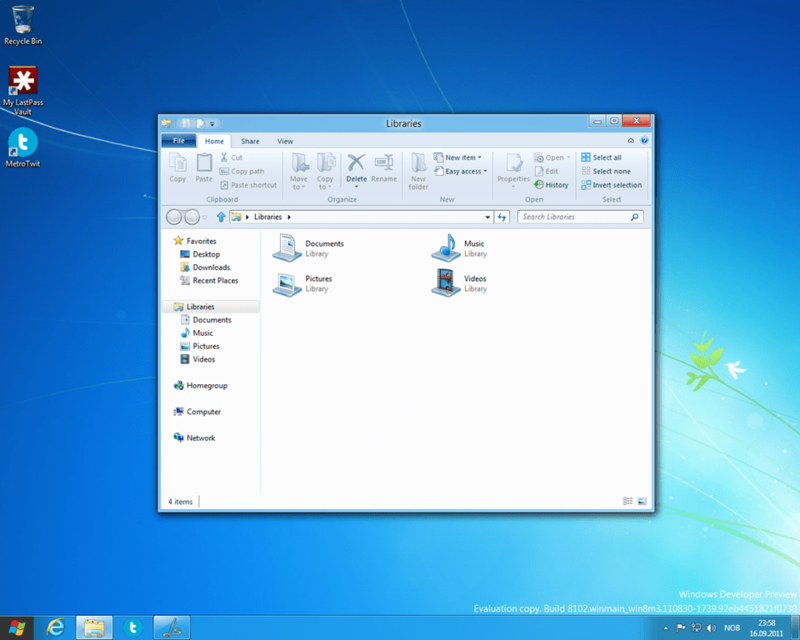 Hitting the IE-icon in the taskbar brings up the more familiar version of IE10 – which allows plug-ins and add-ons. 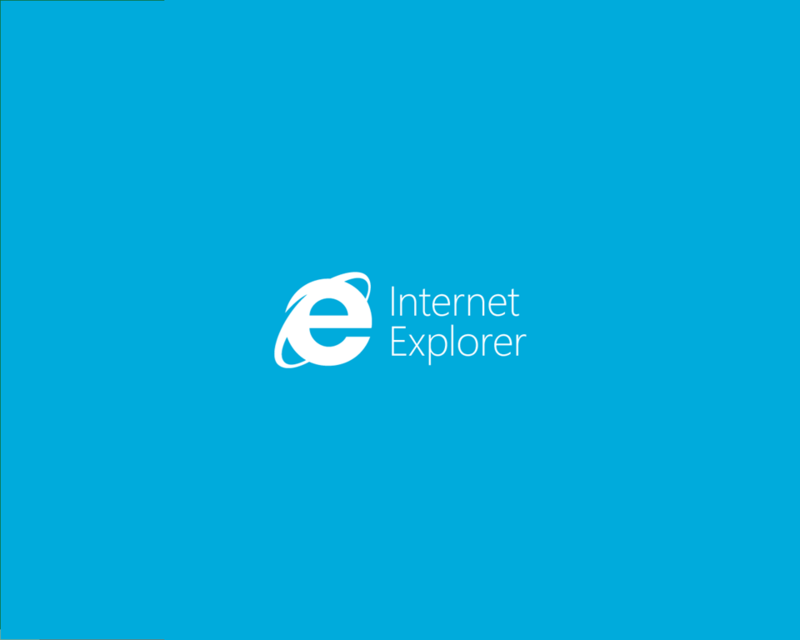 The version of IE10 included in the Windows Developer Preview is numbered 10.0.8102.0 – Pre-release version. 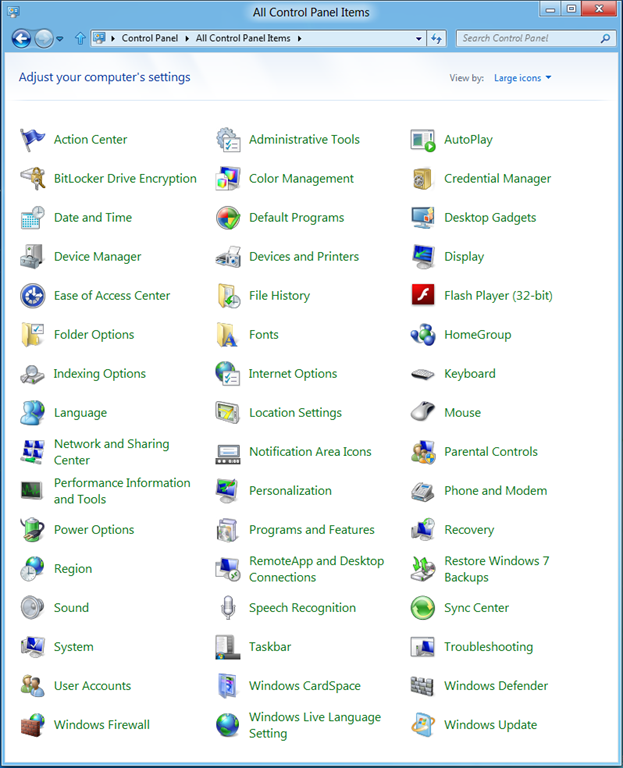 This is the home tab on the Windows Explorer ribbon for the Pictures library. 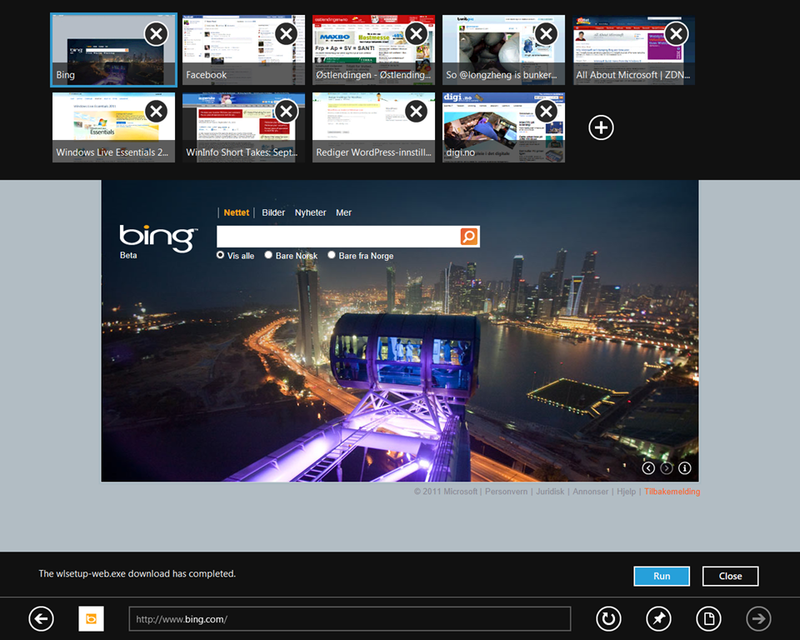 Here is the Share tab in the Pictures library. The View-tab on the ribbon looks like this. 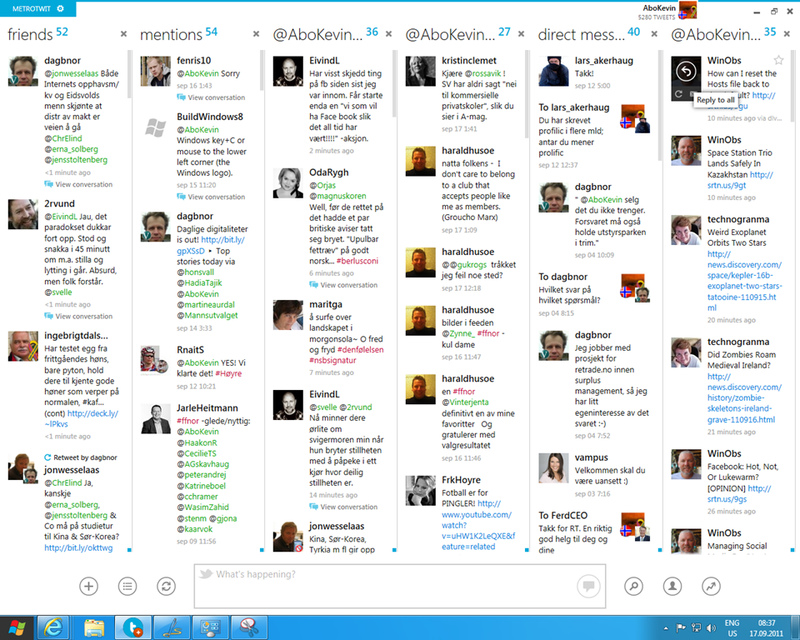 And the Manage-tab looks like this. And here organized by large icons. 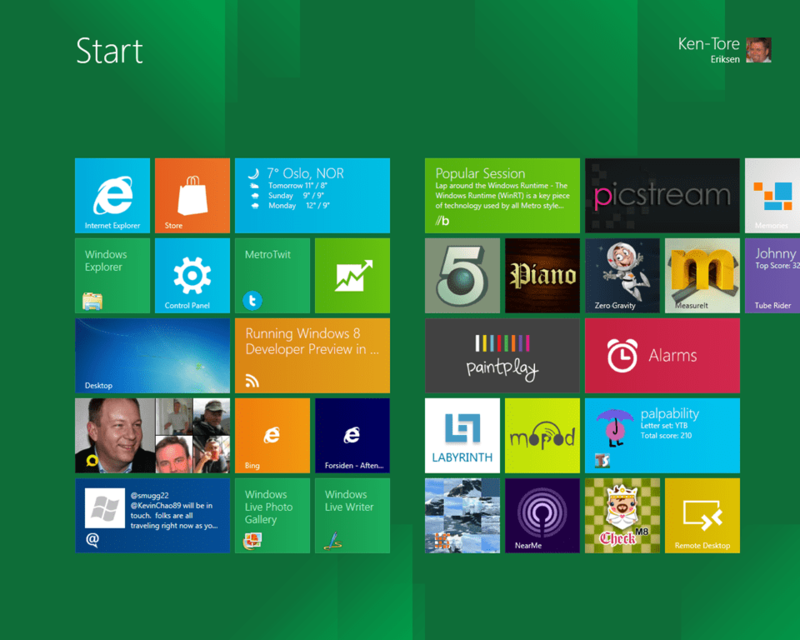 It is great-looking, but lacks too much functionality to be of any use. 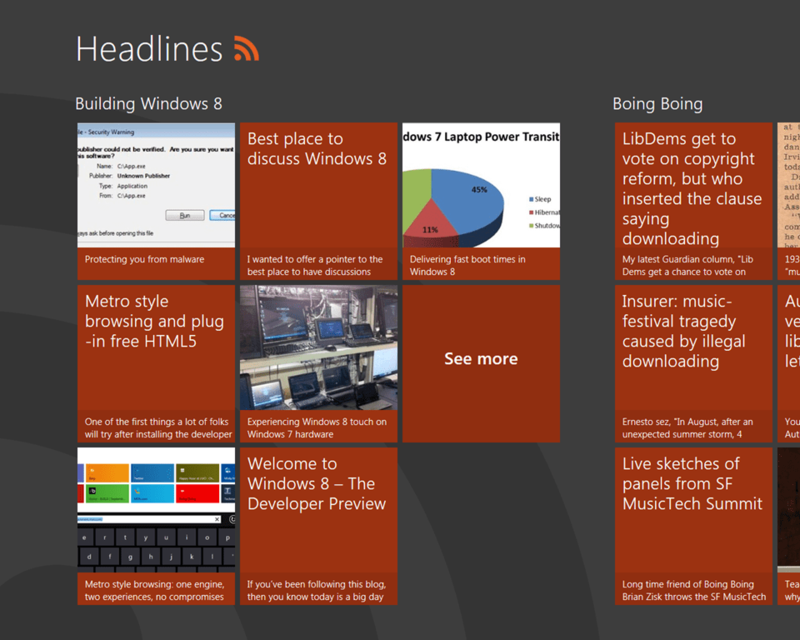 The RSS News Reader included also gives a good Metro-style view of your feeds latest posts. 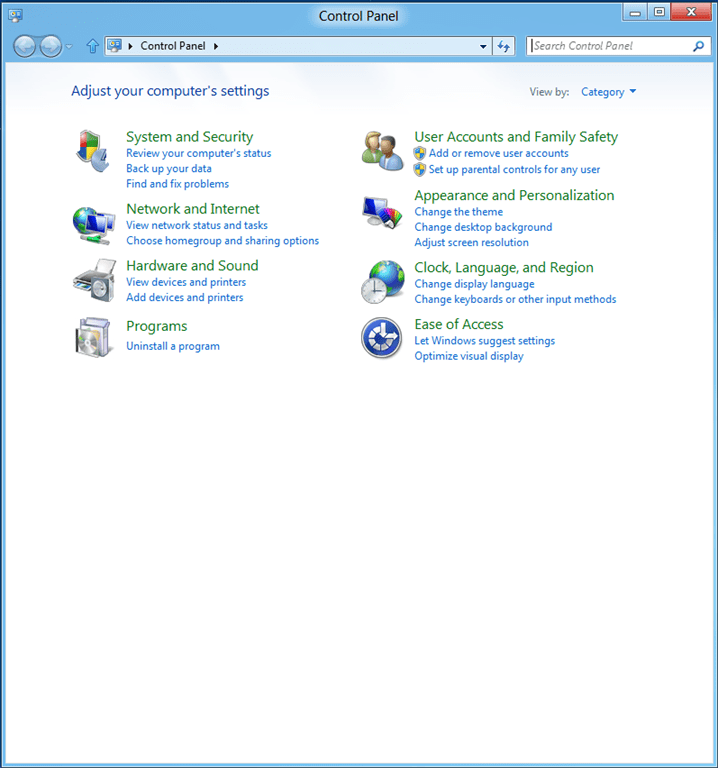 By opening the Charm-bar and choosing Settings, you bring up a context sensitive settings menu on the right side of the screen. 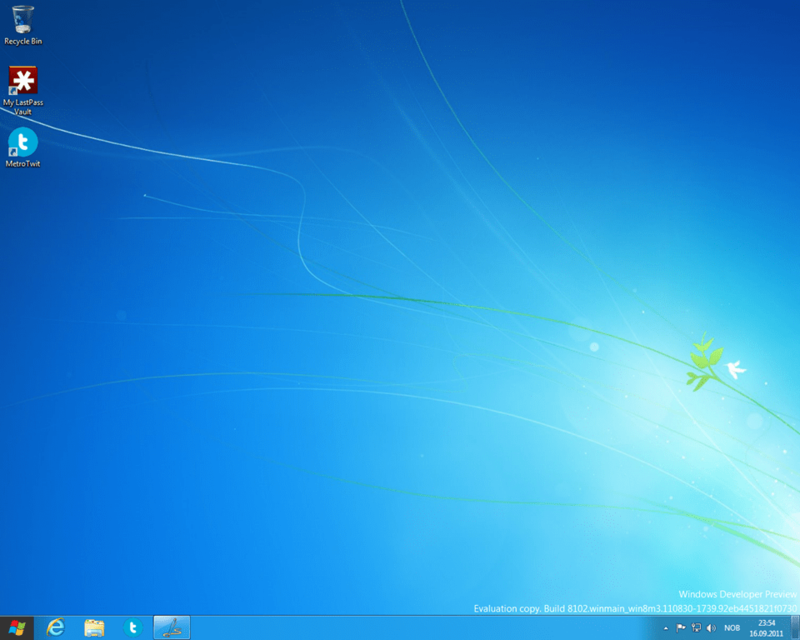 Here related to the Desktop. Not too many options available yet, although it shows off info on Network, volume, Notifications, language selection and power-options. 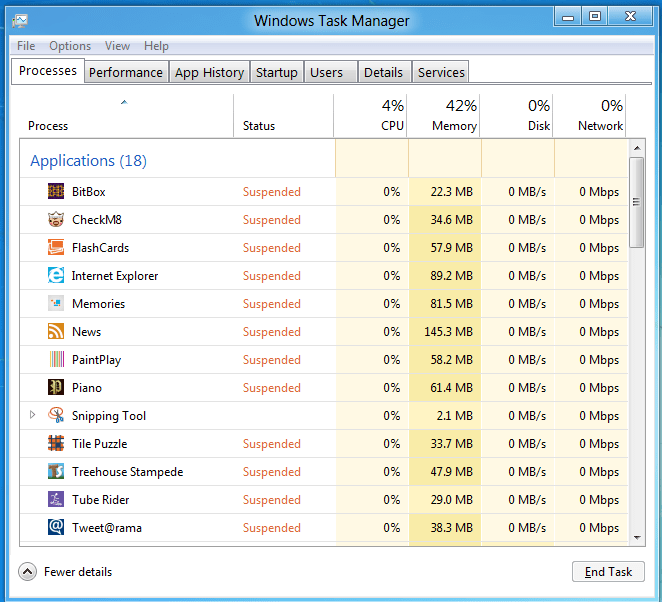 The Windows Task Manager has got a new look. 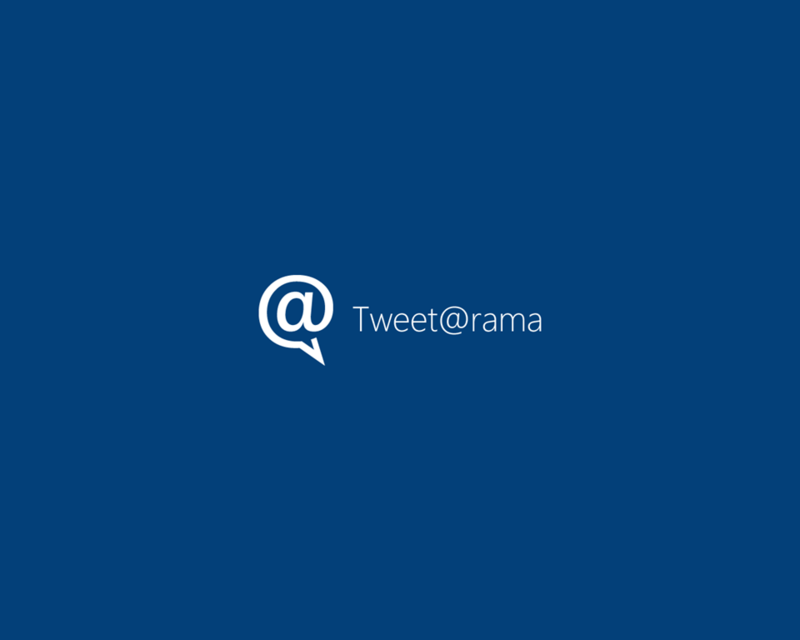 This is the rather minimalistic look that greets you when opening it. 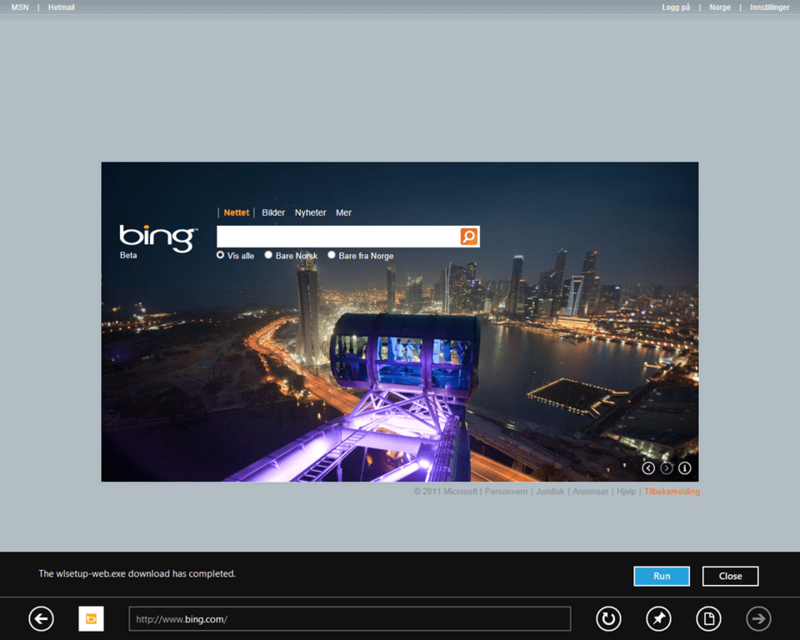 By selecting the More details option in the previous image you get this view. 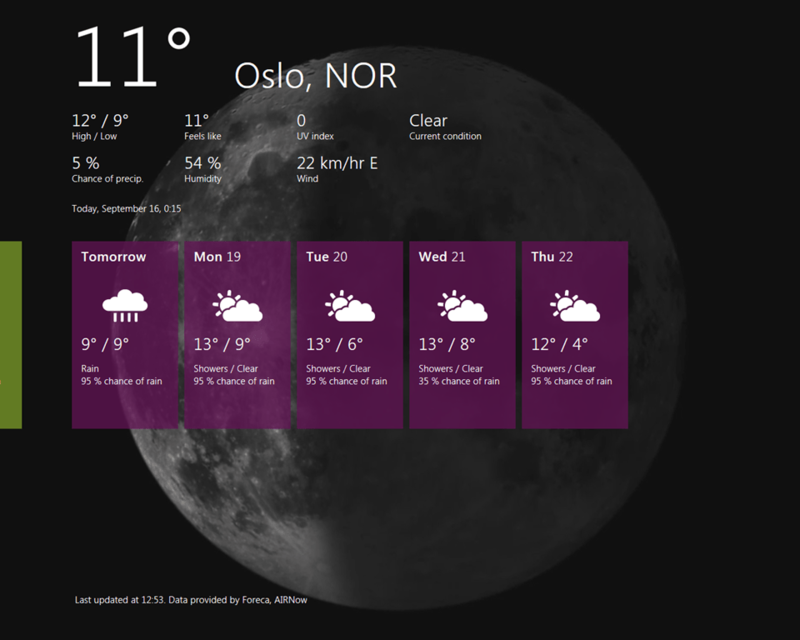 Here we see that when you switch between apps in the Metro-style Start-screen the non-active apps are put in a suspend mode. 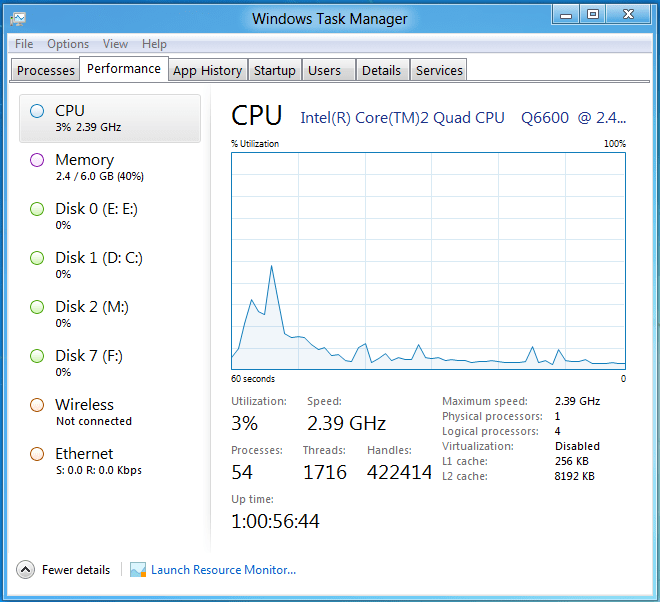 The Performance tab in the Task Manager also has a revamped view. 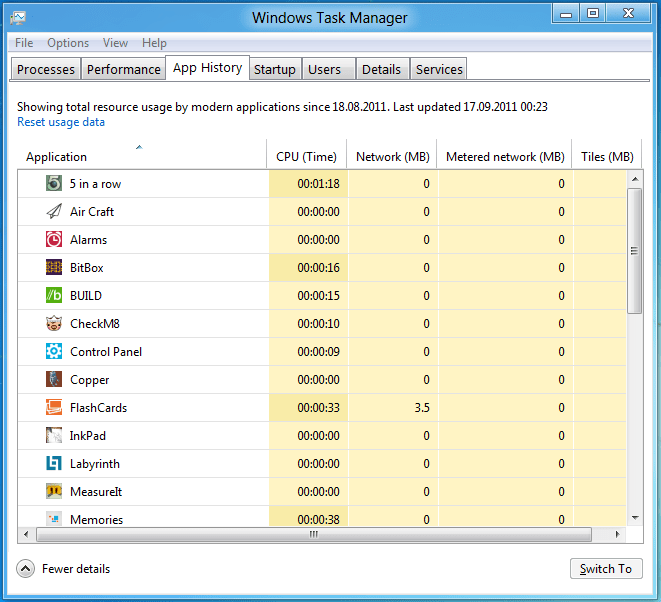 There is a new App History view in the Task Manager as well. 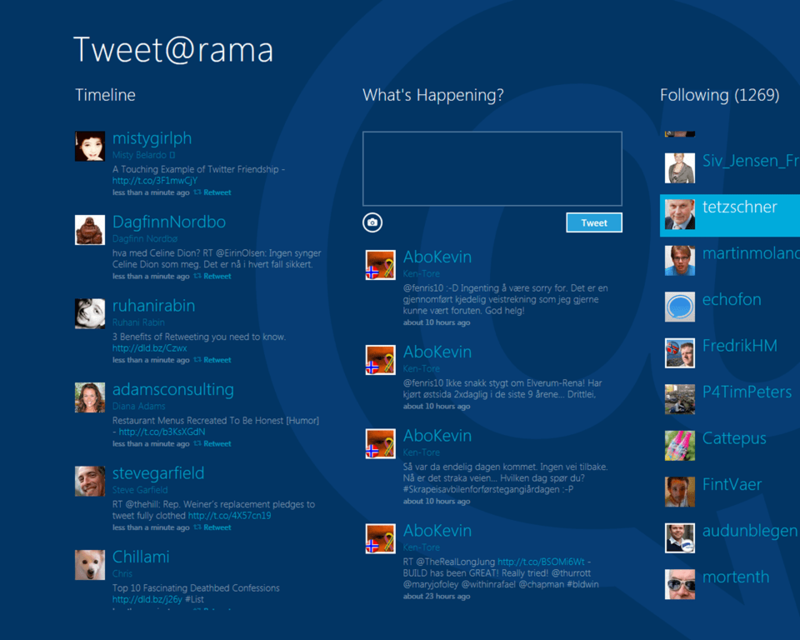 “Old style” Windows applications works just like before; here the beautiful Metrotwit application made by Long Zheng. 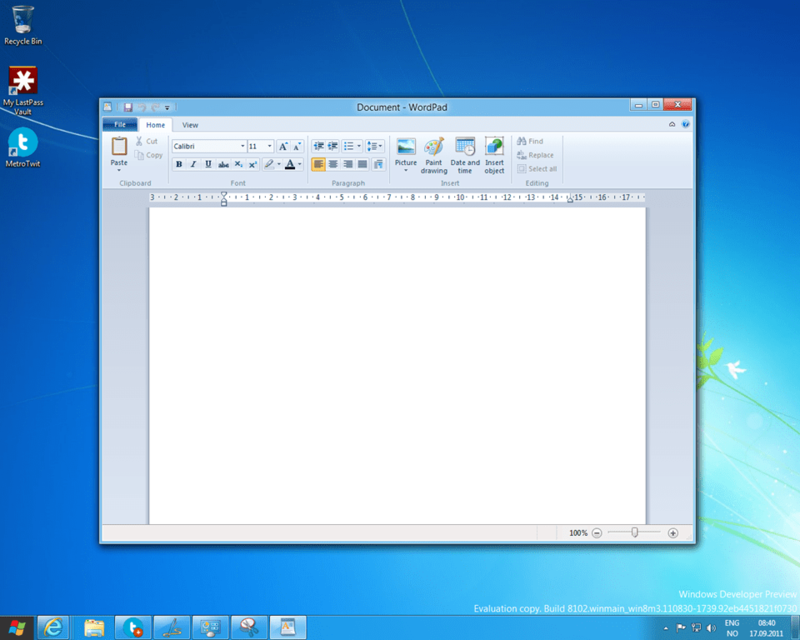 And here is Word Pad. I have installed Windows Developer Preview in a dual-boot on both my desktop and laptop in order to tinker with it and try out the new UI. 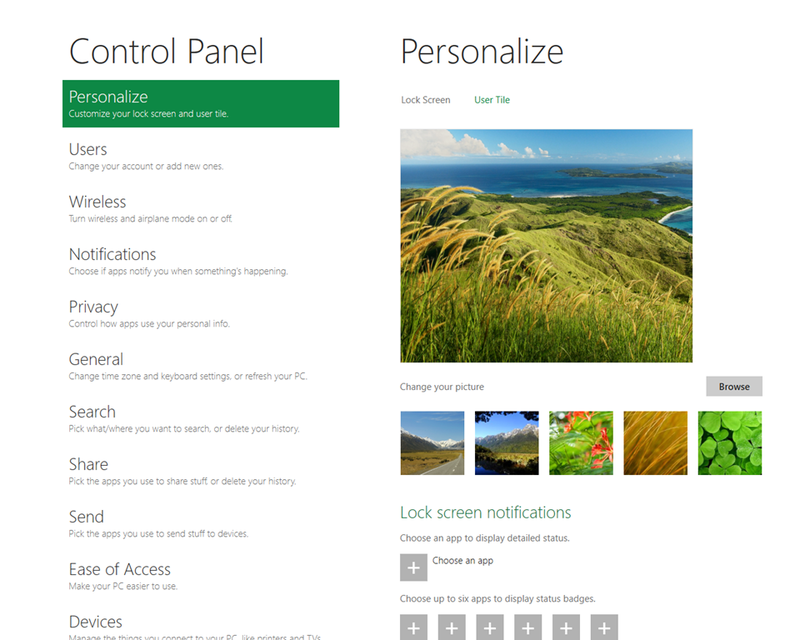 I am not completely sold on the UI for a desktop situation quite yet, but will give it a try to see whether this is a good idea or not. The WDP is in no way ready to replace your daily work-environment but if you do have the space available, partition your hard disc and try it out for yourself in order to form your own opinion. You can download the WDP from here.